The U.S. Alliance brings together individuals, groups and organisations to create a unified voice calling for, and working toward, the end of all forms of physical and emotional punishment of children in schools and homes. The Alliance, through education and legal means, seeks to end all social justification and legal authorization of corporal punishment. 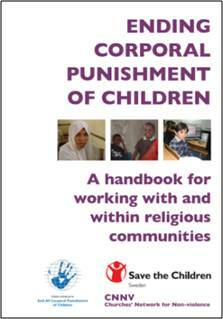 Encourage religious leaders and communities to take a lead in both promoting law reform to give children equal protection and in supporting parents in positive non-violent discipline. Use the Charter for Religious Communities as a framework for activities in your religious community. Use the Kyoto Declaration – A Multi-religious commitment to confront violence against children as a tool for engaging multi-religious support. Hold a Vigil or Event dedicated to children and non-violence. Download a copy of a Vigil held in St Bene’t’s Church, Cambridge 2011.